Cleaning the grill can be a tedious, laborious job if you don’t have the right tools. You’ve been cooking out all summer long. Before you fire up the grill for Labor Day or to kick off football season, take a few minutes to clean off remnants of past barbeques with a non-toxic degreaser for the grill. Your food will taste better and you’ll cut down on the risks of foodborne illnesses when a clean grill is used. Here’s how to clean your grill with the best non-toxic degreaser. Before you use the concentrated degreaser on the grill, let the coals burn so the majority of food debris cooks off. Even if you don’t plan to thoroughly clean the grill with a non-toxic degreaser before you cook, it’s still a good idea to let the fire burn for about 20 minutes to eliminate bacteria that remains from your last cookout. The heat from the flames will kill the bacteria, preventing your family from getting sick from a foodborne illness. Once the grill has cooled, use a wire brush and a biodegradable grill degreaser to scrub the grill rack. For a porcelain-coated rack, use a brass-bristle grill brush to avoid damaging it. If food debris remains after burning the coals, use the brush to remove large pieces, then dilute your concentrated degreaser and spray the cleaner on the grill rack, lid, and body of the grill. Allow the cleaner to sit for a few minutes, then use the wire brush to scrub the rack. A cleaning towel will work to clean the lid and grill body. After cleaning the grill with a non-toxic degreaser, you need to treat the grill rack so it won’t rust in between uses. To prevent rust on your grill, brush olive oil onto the rack. Olive oil is also great to brush on the rack before cooking to prevent burn marks on your meat or vegetables. It defeats the purpose of cleaning your grill with the best non-toxic degreaser if you leave it out to be damaged by the weather. Once you’ve cleaned your grill, use a grill cover to protect it from the elements and save yourself cleaning time in the future. Covers are available for most brands of barbecue and will extend the life of your grill. The cover will prevent rust and keep pollutants like pollen and dirt out of the grill. Having a concentrated cleaner that is eco-friendly and non-toxic means you can effectively clean your grill, protect the environment and keep your family safe from accidentally ingesting dangerous chemicals from other cleaners. 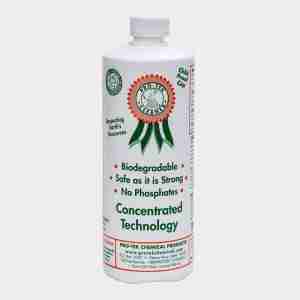 Pro-Tek Chemical’s biodegradable formula means you don’t have to worry about toxins mixing with your food. Once you’ve scrubbed the barbeque, keep it clean with a grill degreaser in between uses. As soon as the grill cools, spray the solution onto the rack and scrub away food debris. Be sure to do this after cooking and not before so your new coals aren’t polluted with last week’s cookout remains.